On Monday, New Jersey was supposed to vote on legalizing the use and sale of marijuana by adults who are older than 21. It seemed like a sure thing. The governor, the state’s legislative leaders, and a majority of the voters all expressed support. It turned out though that they were several votes short of a majority in the State Senate. So they decided to wait. And like other states with legal weed, armored car drivers would have experienced a surge in demand. This is the story. Because marijuana remains federally illegal, big banks refuse to deal with the industry. 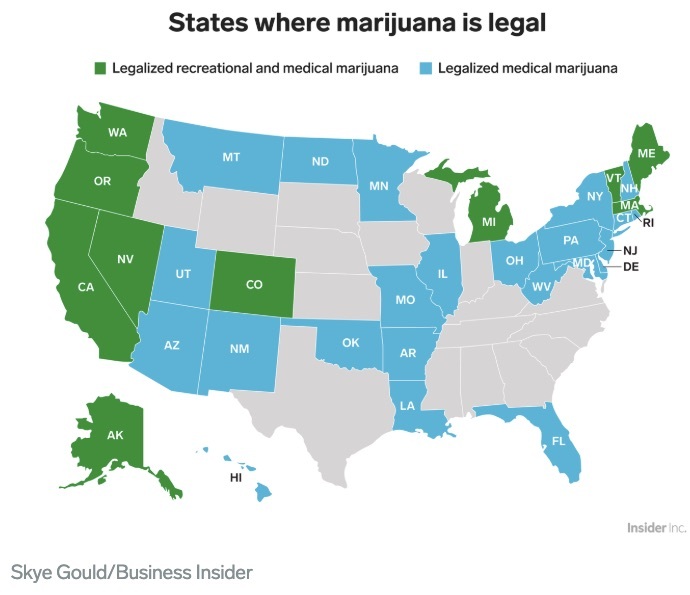 There are 486 or so U.S. financial institutions that serve legal weed but they are small and charge a lot. Customers pay thousands in fees to banks and credit unions for the risk, extra oversight, and compliance rules they have to deal with. As one California cannabis CEO explains, there is considerable hassle when you have limited banking resources. Because his $2 million in monthly sales revenue is mainly $20 dollar bills–no checks, no Apple pay–he needs armored cars and armed guards to transport the money to a secret safe place. His employees spend hours counting and recounting all of the twenties. When his hydroponic marijuana crop got a disease, he had no crop insurance to cover the $600,000 loss. His loan for a new piece of equipment cost triple the normal interest rate. And imagine paying your employees and taxes with bags of cash. Congress is considering the Secure and Fair Enforcement Banking Act of 2019. 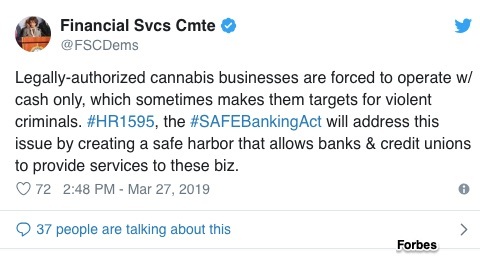 Appropriately named the SAFE Act, it would make big banks safe when providing banking services to pot businesses in states where it is legal. It also would make the recipients of all of that cash much safer because of the non-cash transactions that would proliferate. During the end of March, the House Financial Services Committee approved the bill. The next step is a vote by the entire House. Financial institutions play a hidden role in our everyday lives. Called intermediaries by economists, they link the people with money to those who need it. They eliminate the need to find an individual who will pay for your house, your car, or your new factory. Banks are the go-to places for storing your money, paying your bills, and funding your business ventures. Financial intermediaries have been compared to a beating heart. Like a heart keeps nutrient-laden blood flowing around our bodies, banks pump money around our economy. Whether talking about a healthy body or a healthy economy, a heartbeat and a financial intermediary are crucial. So yes, the marijuana industry would function much more efficiently with a network of financial intermediaries. However, the businesses that store and transport cash would experience a plunge in demand. My sources and more: This story from NPR perfectly summed up marijuana’s banking problems. To read more about the vote in N.J., BusinessInsider and the Asbury Park Press are possibilities. Finally, for the SAFE facts, The Washington Post and WSJ had some details.